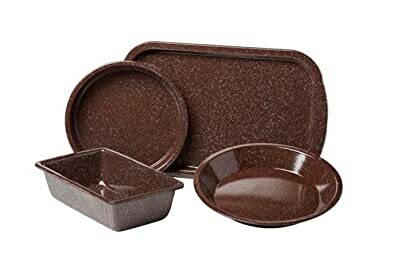 The best ceramic bakeware is made for baking in the oven using many styles of baking containers, such as cake, pie, and bread pans, muffin tins, sheet pans, cookie sheets in an array of shapes of square, round, rectangular with straight sides, fluted sides, and no sides. When you want to bake or cook in the oven, on the stove, or in the microwave, ceramic bakeware is a good choice and appropriate. Ceramic and stoneware are the most multipurpose in many sizes, styles, and shapes. You might look for dishes that you serve in at the table, are microwavable, refrigerator, and freezer safe, and can be cleaned in the dishwasher. Can they go directly from the freezer to the oven? Look at the bottoms of the products and read the labels for their use. Be sure upon receiving them that you wash each piece in warm dish detergent, rinse, and towel dry. The first time you use them, put in a teaspoon of butter or oil, smear around, and wash by hand. Use only silicone, plastic, wood, nylon, or bamboo stirring spoons and spatulas. Serve the food with the same utensils. Metal is sharp, puts dings, and cuts in ceramics, and shortens its life. Use low to medium heat always or your items can warp and be of no use. Read the instructions from the manufacturer for how to care for your best ceramic cookware. If you nest them inside one another, always use a cloth or paper towel or purchase the protectors shown on Amazon.com® in different sizes, shapes, and colors to keep them smooth and free of scratches. The VonShef® high-end designer enamel coated pan in red is the perfect size, and the perfect material that goes into the oven for roasting or baking and then directly to your table. It offers outstanding heat distribution and retention to keep your food baking evenly and cooks at low to high temperatures. The cast iron base retains moisture and your meat dishes will be scrumptiously fork tender. It can be used on gas, electric, ceramic, halogen, and induction cook stoves. Granite•Ware® Roasting Pans by Columbian Home Products have been here since 1901. 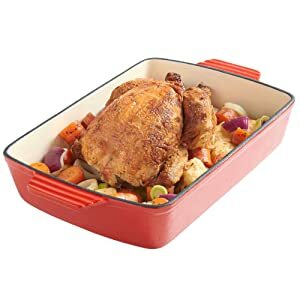 The company evolved from the white spotted turkey roaster to the very fine F0631-2 brown bakeware set that includes a loaf and pie pan, small cookie sheet, and a round cake pan designed for baked goods with a crispy crust, and golden brown edges. The porcelain over steel base provides nonstick, even heat distribution, and is dishwasher safe. You can use metal utensils and the cookware is made in Terre Haute, Indiana, USA. There is no need to add fat to the bottom of the pans. The Cook Pro® white ruffled new design bakeware is easy to clean and is made of cadmium- and lead-free materials for healthy cooking. The sturdy ceramic will not chip and crack perfect for baking. 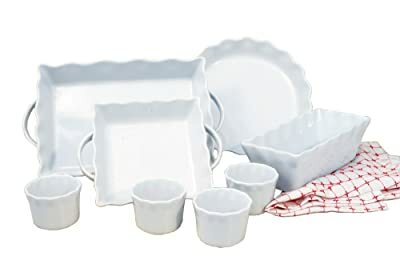 This set includes a rectangular and square baking pan with handle, a loaf pan, a round pan for cakes and pies and 4 ramekins. Oven, microwave, freezer, and dishwasher safe. The Cuisinart® Chef’s Classic™ lasagna and roasting pan model Ci1136-24CR is a lovely cardinal red for searing, grilling, baking, simmering, braising, and casseroles. The cast iron holds and distributes heat evenly. Use in the oven, under the broiler, on the stove top and in the microwave. It is lovely to look at and can go directly to the table and is dishwasher safe. The SilverStone® cheerful marine blue is PFOA- and PFTE-free so you need not be concerned with toxins. The hybrid ceramic set includes two round cake pans, a medium cookie sheet, a rectangular pan, and a loaf pan made of solid carbon steel base. The rolled rims prevent denting and warping. The set will not chip or warp and can be used in the oven up to 500-degrees F. Hand washing is recommended. This is a well informative article, I have learned a lot. 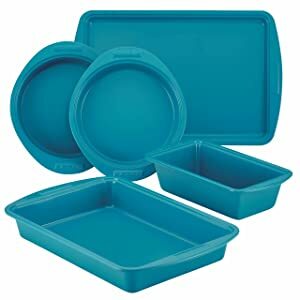 I’m a bit interested in Cook Pro bakeware set, they look beautiful designed. Are they dishwasher safe? Yes, these are dishwasher safe, beautiful, unique design and classy! I love mine! Hope you buy them here by clicking the Amazon button below the description!